In its own words, Rectangle is “an artist run public space project”. What does this mean, exactly? Well, it means that we are faced with something quite unusual here. Rectangle is, in essence, a giant billboard on an unassuming residential street in a quiet corner of Saint-Gilles. It’s much more than that, of course. 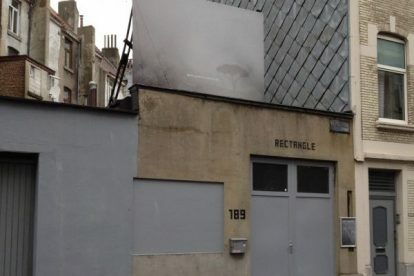 Rectangle is an art gallery, an art project and a clever use of public space that mimics the strategies of advertising to promote artistic engagement with the city. The gallery work space is an old printing factory that is used as an innovative meeting place for artists. You cannot usually visit inside but sometimes they have shows and are open for a few hours each evening – check their website for the latest info. Even when it’s not open, however, it’s worth going by to see the unusual sight of their artistic billboard, which sits on top of the building and is open, of course, 24/7. A different artist is invited every two months to develop an installation specifically designed for the billboard, the building, the street and the unique neighbourhood setting. I highly recommend swinging by on your way to WIELS.